In the name of journalism, Scooter and I made mug-cakes the other night at 2am. Rating: yes. We used the recipe I posted previously, although we substituted melted salted butter for the oil, a recipe mod I endorse because (a), salted butter is a much more useful thing to buy than weird baking oil, and (b) the slight saltiness adds complexity to the flavour of the 5-minute microwaved mug cake. And snacks you make at 2am can always use more complexity, eh? Sometimes I take all the vowels out of the Alpha-Getti just for a challenge. Another recipe mod I would endorse is using a wee bit more cocoa and a wee bit less flour- maybe altering the original recipe’s ratio by a tablespoon in each direction. That would make the cake denser and more chocolatety, both of which are good words in the dessert arena. A not-as-good word in the dessert arena is “obesity”, which can be “caused” by “late-night” “gluttony”. Also: use a large mug. Mixing batter in a mug is challenging, so use a fork (even though the sound of the fork-tines scraping the mug upsets some very primal part of my brain). And stir the dry ingredients well before adding the egg & butter, or else you end up with a layer of dry, unmixed flour at the bottom of your mug cake, like one of us did, and then the other of us (the one whose mom is a professional pastry chef) laughed at me and I hid in the bathroom. I don’t know from baking but I did pick up some cake & pastry flour for the mug cake, and my cake rose pretty well. I suspect that using all-purpose flour might have a detrimental effect- the mug is so small that it’s hard to get bubbles into the batter by stirring- whereas cake flour is more encouraging, promoting better self-esteem in batter applications. It will look like the mug can’t possibly hold all that mug-cake, but it probably will. Mine only overflowed by a couple drips, even though the uncooked batter reached right to the top. Yay uncritical optimism, I bet this means everything else will work out fine, too! Also: don’t forget to buy some milk to wash down your epicurean genius. 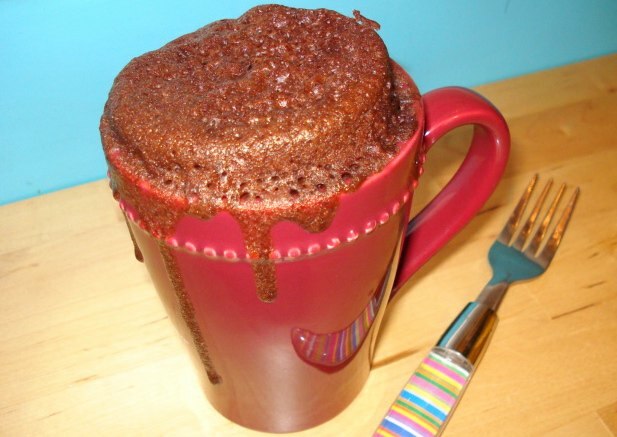 And there we have it, folks: Mug-cake. Dee-licious. This entry was posted on Saturday, July 26th, 2008 at 10:04 pm and is filed under doing it right, food & drink, how-to, longform, review, things i made, things i wrote. You can follow any responses to this entry through the RSS 2.0 feed. You can leave a response, or trackback from your own site. My one concern is that the mug looks awfully difficult to clean afterwards. Food microwaved onto dishware isn’t usually dishwasher cleanable. And just try to get Kimball to rinse his microwaved scrambled egg dish before sticking it into the dishwasher. Go on. Try! Otherwise this looks delish and I want to make one. You know, Mr. j.bone, I confess that I looked at the mug and had a bit of a shudder myself, but then I figured, if water can carve the Grand Canyon, if water can rust the mighty Titanic, if water can slake the thirst of major league athletes, then water can clean this baked-on-cake, by golly. I just put the mugs in some water, and a few hours later the chocolate came right off with just a sponge. You tell Kimball about water. He’ll be a changed man. I had the most bizarre dream last night. You and I were at a taping of Letterman, and while waiting for the show to start David died. You stepped in and took over the show as a last minute replacement. You did an excellent job telling everyone about mug cake. I’m not sure who the guest was that night but I’m sure they left the show well fed. Donny, you know I would SO TOTALLY shill mug cake to the masses on national tv. It would be a web 2.0 version of loaves & fishes. And the world would be a happier place for it. This makes me want to try to do pancake-in-a-mug. In the words of ye ole wise McDonald’s slogin, “I’m lovin’ it”. Re: cleaning the mug: fill it w/warm water, and dissolve a spoon of baking soda, OR make a paste of baking soda and liquid dish soap, shmear it around, and leave it sit – it will clean off w/in an hour or so. This works with even the most burned on sticky goo of all varieties, and will remove stains from your clothes, as well. If you wrote a movie, what would the title be?